Helpful articles for parents of children ages birth to 8. Are you slogging through winter dreaming about warm weather and flip-flops? Well what if I told you that you can find happiness during the winter too. It is the act of embracing whatever is in front of you today. Below is a list of ideas to help transform your mindset. It’s free, accessible and brings you toward happiness. You are in control! I miss my flip-flops……Great I am wearing them to the nail salon! You get the idea. Change your mindset changes your mood. Let me know how it goes! I know you can do it. Refrain from giving more than one chance. Parent more by moving yourself (physical) rather than by your words (verbal). For example, when a child is pulling books off a shelf walk over and say, “lets put the books on shelf” instead of yelling across the room many times. Before responding take 2 deep inhales and exhales. It is ok to pause. It is in the pause that the patience comes. Take time for yourself everyday. Do something you like to do or just sit quietly. Take time to connect with friends or spouse once a week. Socialization may seem hard but it is extremely important. Get out of house everyday. Run an errand, go to the park or visit a friend. Set up boundaries with bedtimes/ dinnertimes/snack times. Try to be as consistent as you can. Fill a pitcher of water in the morning and drink it by nighttime. Hydration keeps you from becoming irritable. If it is very noisy in the house dim the lights and speak in a whisper. If it is quiet mix it up and play different kinds of music. Changing the environment will assist in changing the mood. Focus on the positive rather than the negative. This will change your frame of mind. Accepting your child as flawed. When we spend time with our children day in and day out, it’s easy for us to hyper-focus on a problem behavior or compare them to other children (“His cousin says please and thank you.”). Accepting yourself and your parenting as flawed. Your job is to provide unconditional love and safety for your child, not to anticipate her every whim or keep him from having negative experiences. If you find yourself constantly striving toward some unrealistic ideal or scrutinizing your every move, it may be time to throw away the parenting books and focus on listening to your own instincts. Give these a shot. They may not feel natural at first but you will be encouraged when you notice how they work. These tips will help your house to feel lighter too! Just because an amazing baby comes into your life doesn’t mean your spouse should be pushed to be last on your list. In fact, your baby needs you to put the love you have for your spouse first. You are both going to need this united front when it gets hard in the parenting trenches. I know you feel overwhelmed and watering a plant even seems likes like too much to ask but your baby will benefit from watching your marriage thrive even through the difficult times. Try to carve out a conversation that is not about the routine of the day. Talk about the news, a song or even a funny joke. Connect as a couple not as parents. By establishing a consistent bedtime for your baby it means you have found daily alone time. Just sitting quiet together is an important time to recharge. Sounds easy enough? Slam yourself up against your spouse on the couch when you are on your laptops or watching TV. It makes a huge difference. No explanation needed on this one. When the night comes you will inevitably begin to feel like it is not worth all the trouble to get out. Guess what? Force yourself- it is worth every second. The next day you may even feel exhausted but your happy relationship will be your reward. Managing everyday life can be overwhelming at times. It’s a constant struggle keeping up with our own, let alone keeping track of our children’s lives as well. Every activity requires “stuff.” The only system that has helped me (or my kids) not to forget the “stuff” is the bag system. Created purely by accident but greatly needed, over time I have developed my homemade bag system to sort the chaos. And it doesn’t hurt that I love bags and collect them from all over. It starts with a handful of bags—canvas bags, grocery store bags, shopping bags, and bags that were given to my husband at golf tournaments—then assign an activity that we do, to each bag. When children are little, our job as parents is to organize the bags but as they get older the kids take on the responsibility of keeping the bags filled. 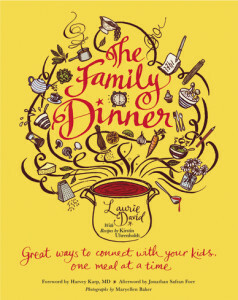 Start the routine of family dinners (when your child is 10 months old it’s not to early!) and hang on to it for dear life. In today’s world families have become so busy, with both parents working, and children scheduled for countless school and athletic events that dinner time has disappeared. The loss of the family dinner is common.Find time to make family dinner a priority. 1. Your young child’s speech development will flourish. Children learn about reciprocity by being part of the conversation. They will also learn about the importance of eye contact and storytelling. 2. Table manners will be taught regularly and by modeling. 3. Setting and clearing the table will allow your children to feel like a part of a family that works together. Opportunities like this, instills the sense of belonging. 4. Children who eat with their parents are more willing to try new foods. The meal becomes not about what they eat and more about connecting as a family sharing their highs and lows. 5. 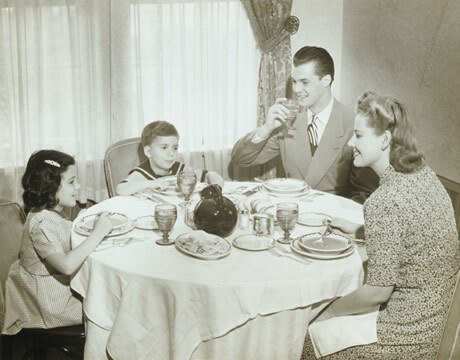 As your kids grew older, more mature conversations will unfold at dinnertime. There is no better way to get to know your teen than through regular dinner conversations where they feel comfortable. 6. Don’t forget about good old fashion fun without technology and where real skills are being fostered (make a rule no phones at the table). Learning good table manners and conversation skills are valuable, but connecting with your parent’s everyday is a life changer.